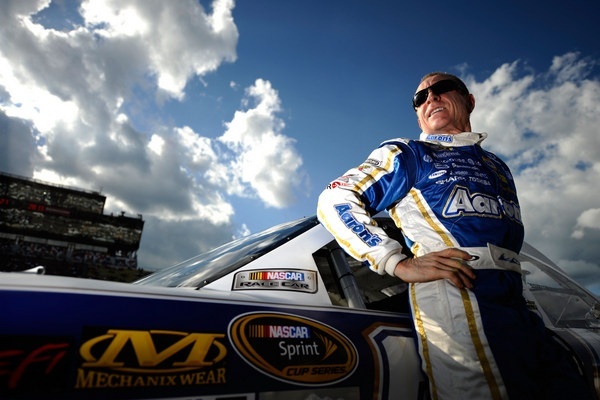 Ageless Mark Martin: the Harry Gant of his era? If pure speed is the game this weekend, and it looks like it will be, then Mark Martin, Carl Edwards, Jimmie Johnson and Matt Kenseth are the men to beat in Sunday's Michigan 400. But gas mileage and clean air -- track position -- could be more important, with speeds as fast as they are. Martin, clocked at 199.706 mph, was a bit slower than Marcos Ambrose' track record of 203.241 mph set in June. Still the fastest part of the track is still apparently well over 210 mph, on the straights. And drivers say at these speeds, aerodynamics is critical. Drivers are running faster than they do at Daytona and Talladega, on a smaller track with less banking. Engines could be an issue, particularly for Toyota teams. Martin, at 53 the oldest racer in the field, is clearly enjoying his part-time schedule this season, his first in Michael Waltrip's Toyotas. He's skipped five of the last seven races. "This is a very, very lucky point in my career, to be able to do things on my own schedule," Martin said. "I've done a lot of racing, so I don't need a lot of practice. I just need a fast car." This is his fourth pole of the season, and it's certainly no fluke, because Martin usually runs well here. However he blew an engine here in June, one of three blown engines this season, in which Toyota's reliability has been questioned, on several fronts. Speed, though, clearly isn't an issue for Martin: "At the test (three weeks ago) it was absolutely insane how much faster we were than everyone else. It was obscene, it was crazy. "But I know how hard these things are to win." There are several different dynamics here this weekend. One, Edwards is struggling even to make the championship playoffs, after dominating the 2011 season. And he's looking for his first tour win in some 18 months. Two, Johnson on the other hand has become the favorite for this title, which would be his sixth in the last seven years. "It's a true honor to beat Jimmie Johnson at something lately," Edwards quipped about outqualifying him. 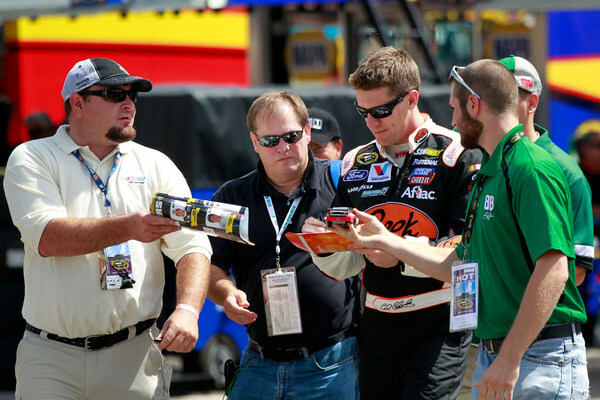 Three, more questions appear to be surrounding the Kurt Busch-James Finch team. Again it is essentially unsponsored, and the economics of fielding a Sprint Cup team every week appear to be telling on the operation, one of the sport's smallest. It didn't help matters when a fluid line broke the first lap of practice, sending Busch hard into the wall, and forcing the team to unload the backup. Without major sponsorship coming on board, it could be difficult for Finch to continue running the full Cup schedule. And Finch is not alone in feeling the financial pinch. Some fellow team owners are complaining about economic difficulties too. These very high speeds, Edwards says, will make it tough to pass. "So qualifying well is important," Edwards says. "If they dropped the green right now, everyone would just line up and it would be a little while before they started to pass." Edwards, starting next to Martin at 1 p.m. ET Sunday, says he is amazed at how well Martin, once his teammate, has continued to perform year after year. Martin's first NASCAR Cup race was in the spring of 1981. "He is living the dream," Edwards says. "He has had a successful career and is able to pick and choose which races he is going to run and he performs well at them. I think that is pretty amazing, especially at his age. "He is an inspiration for me as to how well you can do for such a long period." Edwards wasn't even two years old when Martin ran his first Cup race. So Edwards really wasn't joking when he added "I had Mark Martin toys when I was a little kid... and here he is. "There are generations of people who have all had little Mark Martin toys. "And who knows, my kids someday might be racing against the guy. And they will probably be just as frustrated. "How old is he? 53? He can probably bench press more than all of us and go faster than all of us. He is a pretty spectacular guy." 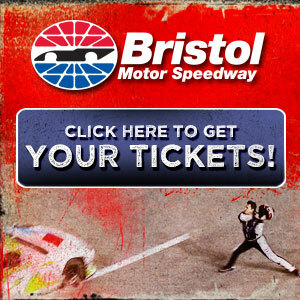 A man who should also be in contention Sunday, Greg Biffle, has missed out on at least four wins here: "Once we pitted and a caution came out. We ran out of gas twice. We botched a pit stop. "You lead the most laps and something happens and you don’t win. "Now we don't make those kind of mistakes anymore." However Biffle hasn't won since Texas in the spring. That thrilling last lap at Watkins Glen last weekend is still on everyone's minds...and maybe will be Monday if Sunday's Michigan 400 is a gas mileage race. The two wild card spots in the chase are up for grabs, with five men looking at the spots. And Brad Keselowski is still trying to speak with Kyle Busch about that last lap run-in: "I spoke with his crew chief Dave Rogers, and I tried to get ahold of Kyle, but every phone number I had must have been the wrong one. "Dumping the leader on the last lap isn't something you want to do. I want to talk with him to see his perspective." 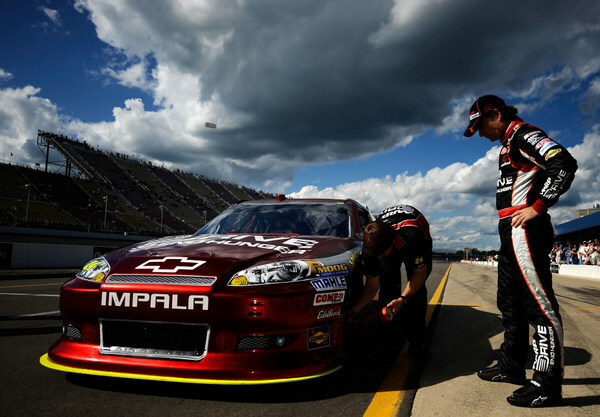 Jeff Gordon suggests the tire construction feels different: "These are crazy conditions. The track has just been strange all day. "This tire just does not like to be pushed hard where the track doesn't load the tire up. Once you get it loaded up it’s not too bad. "But at this place momentum is everything." Gordon is one of the men looking at a wild card, and he's still burned over the final miles at the Glen, over NASCAR not throwing the yellow for Bobby Labonte's oil leak, which made the track so slippery. "If I felt there was a way to change the outcome, and take back that last corner, I certainly would," Gordon says. "It certainly cost us a lot of positions. "Yeah, I'm going to be mad about it at the time... I could have been a little bit more conservative in that last corner and come home eighth or ninth, and that would have still been a pretty solid day for us. But I was racing hard -- probably harder than I should have been. "You hope the sport can gain from that. "Unfortunately it happened at the expense of quite a few guys. "(But) when I watch an NBA game, I want to see them foul at the end: let them play the game. That's why I have to take myself out of the equation there. That was a fantastic finish to the race, very entertaining, great for the sport, great for Marcos and even for Brad. "But somebody pays the price."